The front of the store. What treasures await inside? I'm going to be a bit crazy today by, firstly, bucking today's normal topic, which is "TV Shows from the 80s" and instead resurrecting an older topic from here at Daddy Rolled a 1 by talking about game stores I've visited in my role-playing "career." Secondly, once again being wild and crazy, I'm going a bit out-of-order. I had intended to talk about my game store visits in roughly the order they occurred, starting with the first game store I visited back when I started role-playing in Sandy, Utah when my mom drove me to a place called the Cosmic Aeroplane in Salt Lake City, then talking about the various stores I visited after I moved to California, and along the way mentioning any shops that I could remember while on vacation in other states - I distinctly remember visiting one in Denver in the mid-1980s but I sadly don't remember the name. However, I recently made a trip to Westchester County in New York for business reasons, and while I was all the way out there, I took an extra day to go to Manhattan to do a little site-seeing. I've been to Manhattan a few times before, so I've seem most of the "big stuff." 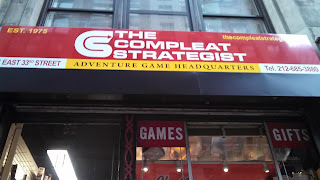 For this trip, since I was by myself, I planned specifically to go visit one of the old-school grand-daddies of game shops, the semi-mythical Compleat Strategist. Tarrytown, and then I took a cab from there into Manhattan to my hotel that I'd specifically picked based on how close it was to the Compleat Strategist (it was a walk just around the corner). It helped that this was a really central area of New York so there was a lot to do in this small area, such as the Empire State Building and the Macy's from the movie "Miracle on 34th Street" which happens to be one of my favorite movies (the original black-and-white version, that is). I had planned to visit the Compleat Strategist on Thursday, but as the cab slowly made its crawl along the New York freeway, I realized that I'd be getting to my hotel around 4pm and the store didn't close until 6pm, so I could go that very evening after checking-in. I stared out the window into the gray, cloudy October sky and began daydreaming about my old issues of Dragon magazine I'd been given as a gift those long years ago back in Junior High School, and the little black-and-white ads in the back where game stores advertised all of the products they carried. They all seemed to be concentrated in the Midwest and East Coast, but as a little kid growing up in Sandy, Utah, they may as well have been in the Soviet Union (that place still existed back then). I didn't get to visit my first "real" game store until the early-to-mid 1990s, which was the Last Grenadier in Burbank, and by then, the store was a little past its prime. I've always had this romantic vision of those early game stores, stocked full with games by Games Designers Workshop and Fantasy Games Unlimited and all of the other companies that made games that I'd heard of but never seen because they weren't carried at Gemco or Hammond's Toys. As the cab got closer to my hotel, I started to get pretty excited. 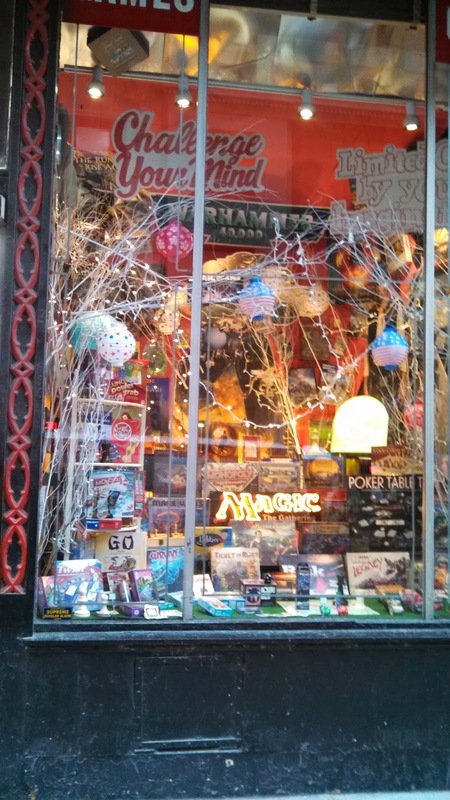 This store, the Compleat Strategist, had been around since the early days of the hobby. 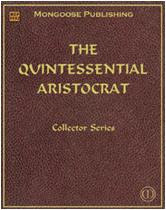 What kind of treasures might I find there, tucked under a pile of books long-neglected in a forgotten corner of the store? My mind raced at the possibilities. The cab finally arrived near my hotel but he overshot it and we were on a one-way street. I threw some money at him, ran back the way he had come to get to my hotel, checked-in quickly and then ran up to my room to change out of my "oppressive monkey suit" as my friend Cal would call it (I actually had to wear a button-down shirt and a sport-coat with my jeans!) into a t-shirt and hoodie, and then I walked over to the Compleat Strategist. Well, with all of that build-up, you can probably guess how my visit was. I couldn't help but be disappointed, but that's really not the fault of the store. That's partially my fault for having built the Compleat Strategist up in my mind into this perfect end-all, be-all type of retail game location that no store could ever live up to. I'm also pretty spoiled in that I have a very large, and fairly well-stocked game store (with a huge "second-hand" used game section) that's about three blocks from my house. Some of the store shelves. 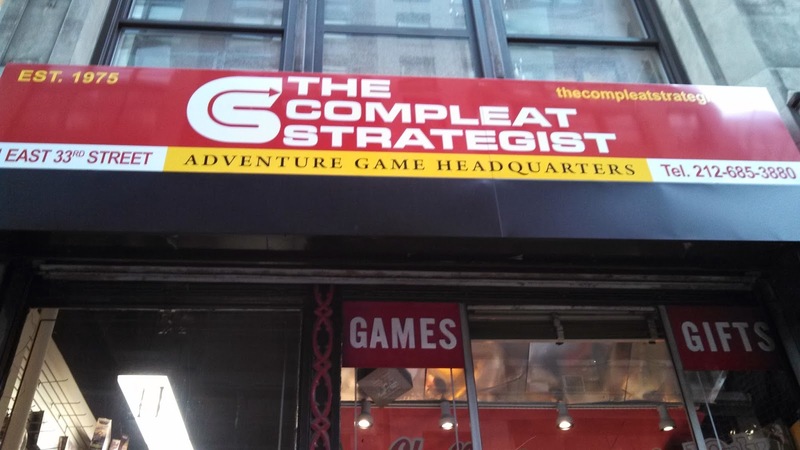 The Compleat Strategist is deceptively small from the outside, but they make up for inside by stacking games from floor-to-ceiling, and I mean that literally. Take a look at the photos I snapped - there are games up so high on the wall at ceiling level that you can barely make out what their titles are, and it would take quite a feat of balance to climb up there to pull one down for a customer. Like most old-school game stores, at first glance there appears to be a pattern of how the games are organized, but as you squeeze through the aisles, you quickly realize that's a mere ruse, and any type of game or accessory could really be found anywhere in the store. I spied some old-school stickers and advertisements plastering the walls toward the back of the store, which made me smile. 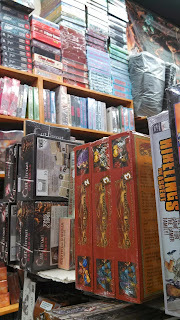 There was a pretty large section of old d20 stuff (which is sad when I'm thinking of that as "old" now), lots of Pathfinder and 4E stuff, and other typical games like Warhammer, Iron Kingdoms, a smattering of Savage Worlds and other RPGs. 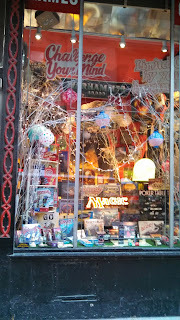 The store seems to focus mainly on strategic board games and some card games, however. I was actually expecting a larger ratio of role-playing games but I suspect these days that board games carry better margins and also probably sell better. With only one other exception besides me (a young woman who said she was from Montana, it might have been Wyoming), everybody else there was focused on board games. A mom came in with her young son to look at some trading cards for some game (I wasn't really listening). The girl from Montana said that every time she finds a game store while she's traveling, she tries to pick up something unique for her gamer friends back home. Last time she'd gotten some distinctive dice. This time she was looking for some miniature figures that were easy to travel with. She spent a lot of time browsing through the old 3.5 stuff. lot of OSR titles that I've read about in the blogosphere here but never actually seen at retail, such as Lamentations of the Flame Princess and Carcosa. 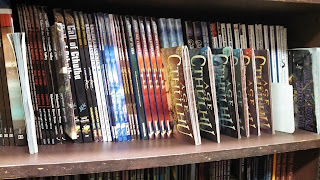 There were also tons of games that I'd never heard of but that looked really cool, some neat Savage Worlds settings including one that took inspiration from the old "Sword & Planet" genre, and whole shelves of Cthulhu-type games and supplements. My local shop doesn't carry any of this kind of stuff - he carries a ton of Pathfinder stuff (which it took him forever to carry) and WotC and some WH40K RPG stuff and that's about it. So, from that standpoint, the Compleat Strategist delivered on that front: stocking stuff that I'd never seen before. Where the Compleat Strategist fell short of my over-expectations (and again, this isn't a fault of theirs) was in older material. I really expected I might find stack of some old Dragon magazines here that I could pick up to fill in the gaps of my collection, or even some older modules or 1st Edition books (I have most of them but am still missing a few of the later 1E books). I was also hoping to see some 2nd Edition settings or things like the green Historical Reference Guides, which were some of my favorites. It would have been cool to also find some older games by other companies, like the FGU and GDW I mentioned above. Obviously the store has been around long enough that all of those items would have been picked over and purchased a long time ago. I guess I was just hoping against hope that something might still be lingering around somewhere. In terms of help at the store... well, to be fair, I didn't engage with anyone directly. I just overheard things. Guy at the front desk, answering phone: "Compleat Strategist. 6pm. Yep. Nope. Yep. Bye." I guess that's not bad, but it was that kind of typical attitude of "Don't call the store while I'm working. You're bothering me." "HEY! CAN YOU COME OUT HERE AND HELP THIS PERSON? SHE HAS A QUESTION ABOUT [insert name of game]!!!!!" Now, the guy at the back of the store seemed pretty knowledgeable and helpful, so that was cool. If I had a question, I hope he'd be the one who would help me out. In the end, I didn't buy anything. I had wanted to pick something up, and I almost bought something "just because" but I ended up talking myself out of it mainly because at this point I just don't need another RPG accessory that's never going to see use in an actual game. I used to buy things just to read, and considered it for the plane trip back, but I'd brought 13th Age with me to read and wasn't even halfway through, so I took a pass. I really enjoyed this post. Thanks for making it. Awesome - thanks for reading! I actually just discovered your blog a few weeks ago or so, and have been reading faithfully via Feedly on my iPad. Last night I was reading your synopsis of the discussion on the D&D/M:TG cross-over. Really interesting stuff. Not sure how much you've poked around here, but I worked on the advertising campaigns for some of WotC's products right when 3rd Edition came out. I wrote a 4-part post about my experiences just to illustrate how even something as cool as fantasy games can be soured by corporate American bureaucracy. Part 1 is here. At the bottom of that post there are links to the other three parts in the series. That's like, really righteous. I'm always forgetting that people actually read me - especially when I'm reading their stuff and digging it. So, pretty cool all around. 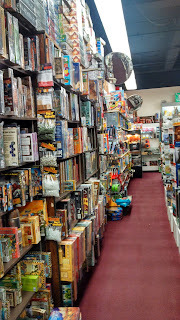 The Complete Strategist in NYC is not only my FLGS, it is a store I have been shopping at for over 30 years now. I first went there at the age of 13 I believe. I know the owner, his family, I'm old friends with 'the guy in the back who knows his stuff' and if you saw a younger fellow in the front of mixed Caucasion/Asian lineage, that is one of the players in my current group. I worked there myself for over a year or so just at of college to assist with the November/December holiday rush. While it may seem to have less of the old stuff, there is a secret to the place only locals know. Danny, the owner, never puts stuff on sale (or rarely). He also never raises the prices beyond what they were originally marked at. This means, if you do find something from the old days in a side rack or overlooked shelf, it's the same price it was when it came out in the 80's. Knowing the place like the back of my hand, I know where to dig. Picked up some Judges Guild and FASA Traveller stuff about a year ago for like $5 or $6 dollars a piece. You can get WEG D6 Star Wars modules and their old Star Wars Adventure Journal magazine, right this moment, as it's on the top shelf of the first or second cabinet on your left as you come up the entry way stairs. Yes, I am there that often. There are other 'Strats' too, but I've only been to one or two of them, only one time each and not in a very long time. Great post! Can't wait to hear about others. Thanks so much for stopping by and reading the post! It seems to be one of my more popular ones lately. Danny (your friend) seemed really knowledgeable and also friendly. And, yes, I did see the younger guy at the front counter that you mention above. Now I feel badly that I didn't talk to anyone there. I was really focused on trying to look through everything. I'm definitely going to head back the next time I go to New York! I'll let you know when I plan to visit.! Thanks for the post, Martin! Good stuff. 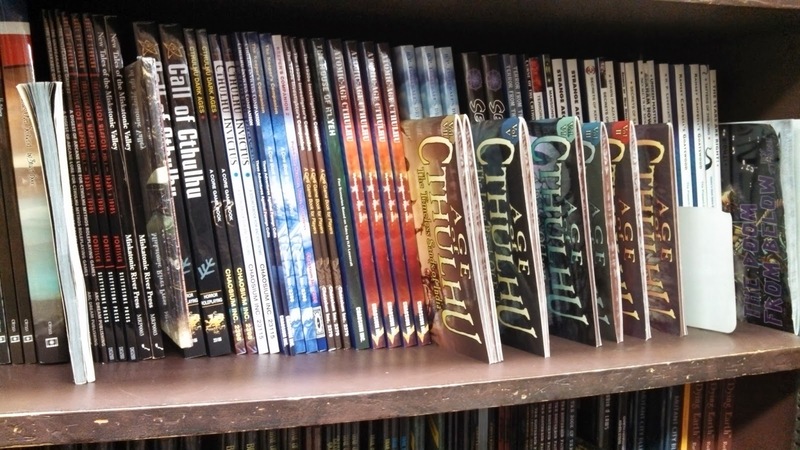 I need to make a pilgrimage to Compleat Strategist someday. I think you need to go to help give you a "pick me up" caused by your lack of gaming lately. :) I've been reading about your current situation on your blog. Hopefully you can just do a one-shot now and again. I haven't gamed since the first week of October and probably won't be able to again until after the first of the year just due to everyone's schedule plus people (including me) having been sick or traveling, etc. I am really enjoying this series! And I had totally forgot about this place though I remember the ads in Dragon. 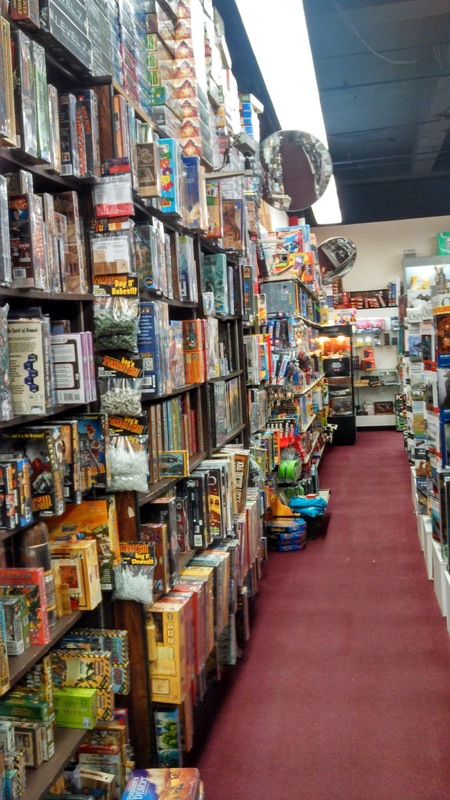 If you get to the Chicago area make sure you check out Games Plus out in Mount Prospect. Thanks Tim! Oddly I've only ever been to Chicago once, on business, and it was an overnight trip. But, my wife loves it there so we're thinking of potentially going on vacation sometime, and if so, I'll check out Games Plus. Glad you're enjoying my game store series. I believe that Brookhurst Hobbies over here in Orange County is up next.